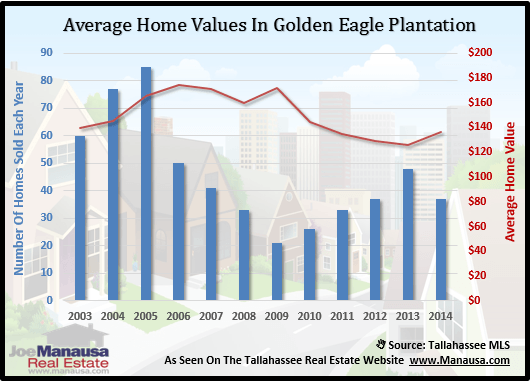 We have been producing home sales reports for Golden Eagle Plantation in Tallahassee for many years, and the opportunities for home buyers have never been better. Now, before you dismiss this as a typical real estate cheer leading "buy my listing" article, you may want to examine the compiled evidence below. With more than 40 homes currently listed for sale in Golden Eagle Plantation, and less than 3 selling each month, the pressure is on home sellers to lower their prices to meet the demands of the few and picky home buyers. Home sellers who have tried and failed at higher prices are finally starting to lower their prices in Golden Eagle Plantation. After having out-performed the market for years with relative value retention, it appears as if Golden Eagle Plantation home owners are "catching up" to the rest of the market when it comes to overall depreciation. The average sales price of a home sold in Golden Eagle Plantation thus far in 2012 is $406,000, down considerably from the $467,000 average from 2011. 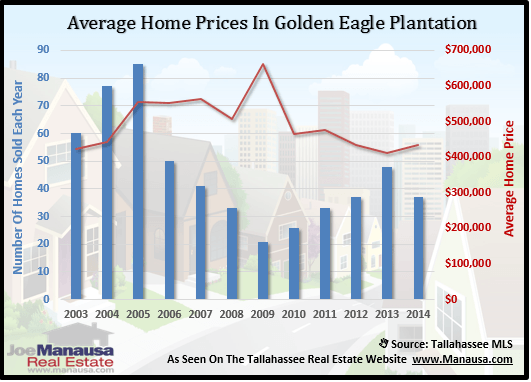 In fact, the average home price in Golden Eagle Plantation is now down 28% since the peak of the market, when the average home price was $565,000 (2007). This first real estate graph shows that average prices are now below the 2003 average, and we can only assume that this is bolstered by favorable interest rates, which make buying a larger home easier for most buyers. Imagine what will happen when interest rates start to rise? More important than average home price movement, the graph below shows home value changes in Golden Eagle Plantation. My first measurements of values begins in 2003, and you can see that current values have dropped far below where they were 9 years ago. With robo-signing a thing of the past, foreclosures and short sales are going to be increasing in number all through the Tallahassee real estate market, and Golden Eagle Plantation will have its fair share. People who are thinking about selling a home in Golden Eagle Plantation should act fast, or be prepared to receive less money should they sell over the next few years. As far as being a buyer today, you have the proverbial "pick of the litter." The only reason you might consider hurrying is mortgage interest rates. You should be more worried about the effect of rising interest rates than the potential for falling values, as we have shown in past articles, the former will have less impact than will the latter. Take a look at this great buy in Golden Eagle Plantation for less than $400K, or this incredible Golden Eagle golf course home for $300K. 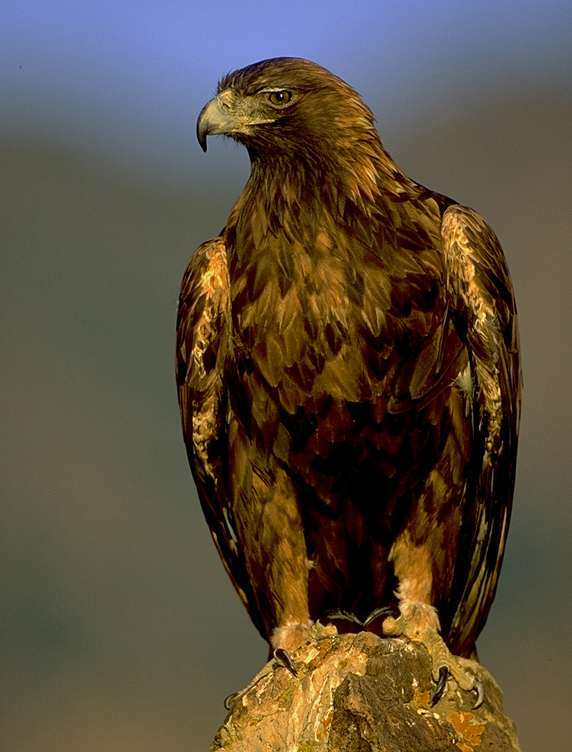 Please check back with us in the future for more Tallahassee neighborhood home sales reports, including the popular Golden Eagle Plantation.